CITY OF CORINTH - Corinth was the capital of Achaia and located 40 miles west of Athens on the narrow isthmus connecting Peloponnese (on the south) with northern mainland of Greece (all uses of "Corinth" - Acts 18:1; 19:1; 1 Cor. 1:2; 2 Cor. 1:1, 23; 2 Tim. 4:20). Corinth was located between the Aegean and Adriatic Seas (see map below) and was a port city about five miles in circumference just south of the sharply rising 2000 foot Acrocorinth (see picture and see map "G") from which Athens could be seen on a clear day. The Temple of Aphrodite (Roman = Venus) was located on the Acrocorinth and housed the 1000 "priestesses" employed as hierodouloi (from hieros = consecrated to deity + doulos = bondservants) who served as temple prostitutes to facilitate idolatrous "worship" (cf "sacred prostitution"). As an aside it is notable that Scripture often associates sexual immorality (porneia) with idolatry (eidololatreia) (cf 1 Cor 5:11, 6:9, Eph 5:5-note, Rev 2:20-note, Rev 21:8-note). And remember that Paul also associated idolatry with covetousness writing that "greed...amounts to idolatry." (Col 3:5-note, Eph 5:5-note) Worship at the temple involved sexual encounters with these "priestesses" and this attracted "worshipers" from all across the Roman world. It is even recorded that the sandals of these notorious priestesses of Aphrodite were studded with an imprint that spelled our "Follow me" in the dust of the street (What a contrast with Jesus' call to "Follow Me" - Mt 4:19)! One cannot help but think of similar seductive pictures found on the internet even on seemingly innocent sites such as news pages! Clearly this illicit "worship" was a great temptation to the Christians at Corinth (just as is the internet to Christian's today!) as evidenced by Paul's exhortations and warnings in this first letter (1 Cor 5:1, 9,10, 11, 1 Cor 6:9-11, 12-17, 18, 19, 20). The immoral condition of Corinth is vividly seen in the fact that the Greek term (coined by Aristophanes) Korinthiazomai (lit., to act the Corinthian) came to mean "to practice fornication." Aleiphro wrote "I did not enter Corinth after all, for I learned in a short time the sordidness of the rich there and the misery of the poor." "Ships wanting to avoid the dangerous trip around the southern tip of Greece were dragged across that isthmus. The city boasted an outdoor theater that accommodated 20,000 people (See reconstruction of Corinth circa A D 100), athletic games second only to the Olympics, a Greek, Roman, and Oriental population....There were taverns on the south side of the marketplace, and many drinking vessels have been dug up from those liquor lockers. Corinth was noted for everything sinful." (Charles Ryrie) Every shop in the city had a deep, spring-fed well in which to cool containers of wine. Strabo wrote that "All the people of Corinth gorge themselves." It was even customary in stage plays for actors to come on stage drunk. In the picture below note the agora which was the city's marketplace and the Bema which was the judgment seat. Corinth had an extensive commerce, like all the large towns on the Mediterranean Sea, and became celebrated for its wealth, magnificence, and learning. Corinth's pottery, brass and marble for building columns were famous throughout the world. The city is now desolate with just a little village near the ancient Corinth. There is, however, a modern city of Corinth, a few miles away, with about twenty thousand inhabitants. Archaeologists have also discovered a broken lintel (part of a door) bearing the Greek description "synagogue of Hebrews." Paul preached at Corinth about A.D. 53 for eighteen months (Acts 18:11). He paid Corinth a short second visit during the period A.D. 54–57, not mentioned specifically in Acts but implied in 1 Cor. 16:7; 2 Cor. 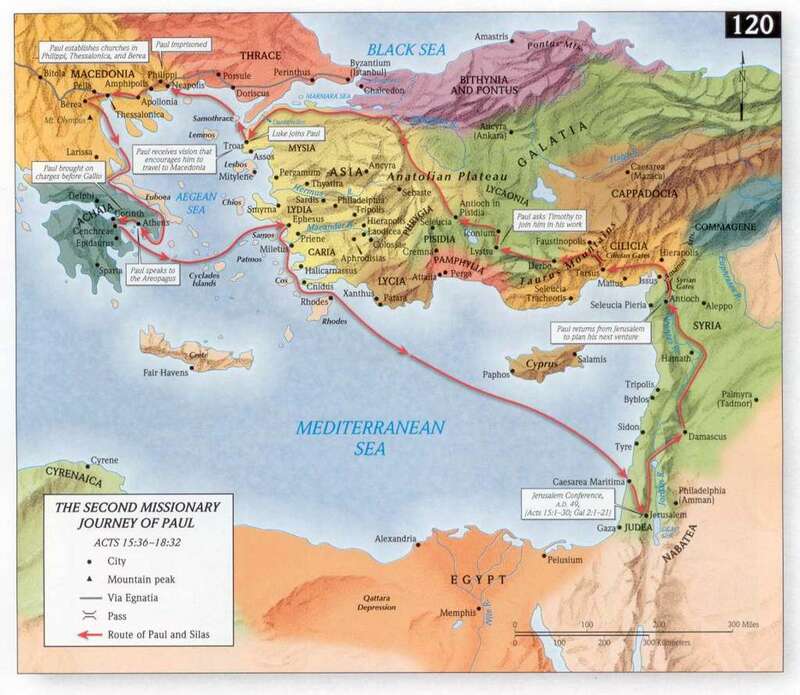 12:14; 13:1, where he speaks of an intended third journey to Corinth which coincides with that in Acts 20:2. He spent three winter months in Corinth (A.D. 57 and 58), during which he wrote the Epistle to the Romans (Acts 20:2, 3 [cf. 1 Cor. 16:6]; Rom. 16:1). 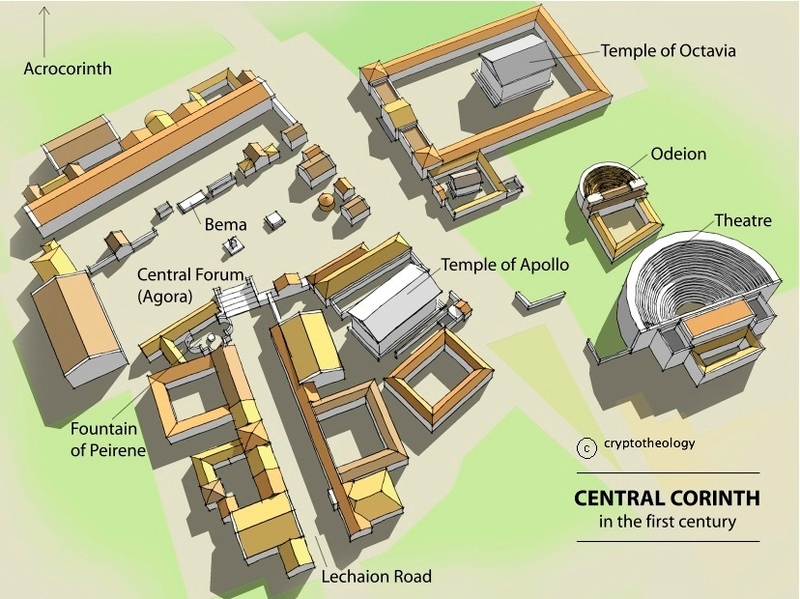 In summary, Corinth was a city with a prevalent pagan influence and a plethora of perversions (1 Cor 6:9,10) but despite these apparent obstacles to the Gospel, the Spirit enabled Paul to plant a church in the center of vice and idolatry on his Second Missionary journey (1 Cor 3:6, 10; 4:15; Acts 18:1–7). About 180 pages of sermons on 2 Corinthians - recommended. 2 Corinthians 2:12-17 How Do You Smell? 2 Corinthians 6:14-7:1 Are We to Engage the Culture or Separate Ourselves From It? Yes! 2 Corinthians 9 Giving: What's In It For Me? 2 Corinthians 12:11-21 With Friends Like This, Who Needs Enemies? Similar to above but less Greek. D Edmond Hiebert - A clear and full interpretation by a British Methodist scholar of the past century. 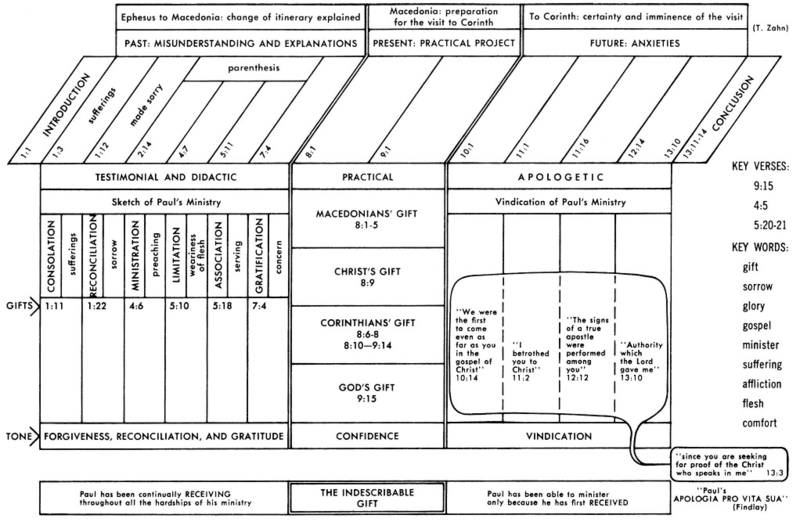 Its doctrinal summaries are intended as a contribution to systematic theology. What can we learn from the life of Paul? 2 Corinthians 1:22, 5:5 What is the seal of the Holy Spirit? 2 Corinthians 3:18 -What is the meaning of “from glory to glory” in 2 Corinthians 3:18? 2 Corinthians 3:18 What does the Bible say about transformation? 2 Corinthians 4:4 - How is Satan god of this world? 2 Corinthians 4:4 Why does God allow deception? 2 Corinthians 4:6 What is Spiritual Blindness? 2 Corinthians 4:8 What does the Bible say about despair? 2 Corinthians 4:7 What does it mean that we have treasures in jars of clay? 2 Corinthians 4:6 What is the inner man? 2 Corinthians 4:17 What is glorification? 2 Corinthians 5:21 What is righteousness? 2 Corinthians 6:2 What does it mean that today is the day of salvation? 2 Corinthians 6:14 What does it mean to be unequally yoked? 2 Corinthians 6:14-17 What is biblical separation? 2 Corinthians 6:14 Is it good to have close friendships with unbelievers? 2 Corinthians 7:10–11 What is godly sorrow? 2 Corinthians 8:6, 16-17 What Can We Learn from the life of Titus? 2 Corinthians 9:6 What does the Bible say about sowing and reaping? 2 Corinthians 9:7 How can I become a more cheerful giver? 2 Corinthians 9:8 Why is giving so emphasized in the Christian faith? 2 Corinthians 10:3-4 Spiritual strongholds - what is the biblical view?" 2 Corinthians 10:3–5 Do we need to be aware of the spiritual battle that is taking place around us? 2 Corinthians 10:5 What does it mean to take every thought captive? 2 Corinthians 11:5 Who are the super-apostles Paul mentions? 2 Corinthians 11:14 What does it mean that Satan masquerades as an angel of light? 2 Corinthians 11:14 How can I recognize a false teacher / false prophet? 2 Corinthians 12:1-4 What does the Bible say about an out of body experience / astral projection? 2 Corinthians 12:2 Are there different levels of Heaven? Are there three heavens? 2 Corinthians 12:2-5 What does the Bible say about near death experiences? 2 Corinthians 12:7 What was Paul's thorn in the flesh? 2 Corinthians 12:9 What is the key to truly experiencing God? 2 Corinthians 13:5 If our salvation is eternally secure, why does the Bible warn so strongly against apostasy? 2 Corinthians 13:5 What are some of the signs of genuine saving faith? 2 Corinthians 13:12 What exactly is a 'holy kiss'? 2 Corinthians 13:14 What does the Bible teach about the Trinity? 2 Corinthians 6:14-18 Come Out From Among Them! 2 Corinthians 10:3-6 Spiritual Warfare! D Edmond Hiebert - A voluminous conservative Lutheran exposition. The epistles are divided into convenient paragraphs, with the material under each section appearing in three parts, exegetical and critical, doctrinal and ethical, homiletical and practical. Contains much rich ore to be mined by those willing to dig into its closely printed pages. 2 Corinthians 6:14 What Does It Mean to Be, "Unequally Yoked?" 2 Corinthians 9:6 If We Give Generously, Are We Guaranteed to Receive Abundantly? J. H. Bernard, in vol. 3 of the Expositor's Greek Testament (1903). J. Denney's (1894) older and out-of-print work is most reliable and helpful throughout. CYRIL BARBER - Recommendations for your library - The Minister's Library 3 and The Minister's Library 2 . See also 850 books for Biblical Expositors. Barnett, Paul William. The Message of 2 Corinthians: Power in Weakness. The Bible Speaks Today. Downers Grove, IL: InterVarsity Press, 1988. With remarkable brevity Barnett gets to the heart of Paul's second letter to the believers in Corinth. He cuts through extraneous material and presents his readers with a clear exposition of the meaning of the text. *Barrett, Charles Kingsley. A Commentary on the Second Epistle to the Corinthians. Harper's New Testament Commentaries. New York: Harper & Row, 1973. †An exegetical study that will be of help to the expository preacher. Barrett is always worth consulting. Barnett, Paul William. The Second Epistle to the Corinthians. New International Commentary on the New Testament. Grand Rapids: Eerdmans, 1997. Replaces the famous volume by the late Philip E. Hughes. Assumes the unity of the letter, for which extensive argument is offered. Combines careful exegesis with a vindication of Paul’s person, mission and message. Exposes the teaching of “false apostles,” and discusses the resurrection and the hope of a new body. Not as good as Hughes, so if you have the former NICNT work, hold on to it. Baughen, Michael. Strengthened by Struggle: The Stress Factor in 2 Corinthians. Wheaton, Ill.: Harold Shaw Publishers, 1984. "Baughen has effectively mixed his scholarship and pastoral gifts to bring us fresh insight into St. Paul's remarkable second letter to the Corinthian congregation. What he has demonstrated ... is that the doctrinal and moral issues that tore at the soul of Corinth are still with us today" (Gordon MacDonald). Baumann, J. Daniel. Confronted by Love. Ventura, Calif: Regal Books, 1985. A brief exposition of God's principles for daily living from 2 Corinthians. Designed for adult discussion groups. It is to be regretted that this book was published on newsprint. The appearance alone will militate against widespread acceptance. Belleville, Linda L. Second Corinthians. IVP New Testament Commentary. Downers Grove, IL: InterVarsity Press, 1995. A careful study of 2 Corinthians that contains many new insights. The author aims at elucidating the meaning of the text, and in this she succeeds. A popular resource. Danker, Frederick W. Second Corinthians. Augsburg Commentary on the New Testament. Minneapolis: Augsburg Publishing House, 1989. Danker is a careful expositor and a man of remarkable erudition and perception. Here is a brief exposition that many will find helpful. Garland, David E. Second Corinthians. New American Commentary. Nashville: Broadman & Holman, 1999. An excellent exposition that is fully abreast of the latest scholarship. Deals adequately with Greek nuances, and combines historical and cultural material with an explanation of the theme of Paul’s letter. Of great value to preachers. Gromacki, Robert Glenn. Stand Firm in the Faith: An Exposition of II Corinthians. Grand Rapids: Baker Book House, 1979. A well-balanced exposition using the text of the KJV Provides an excellent treatment of Paul's theme. Gives evidence of Gromacki's exemplary use of the original Greek. Recommended. Hafemann shows how Paul portrays himself as "the Spirit-giver who suffers," whose importance as a God-sent revelatory agent of the Spirit is such that rejection of him is rejection of God. (He could as easily have developed the line of the theocracy and reached the same conclusion.) One pleasing feature of Hafemann's work is that, contrary to most modern biblical scholarship, he sees the unity and coherence of Paul's argument. Hendricksen, William. New Testament Commentary. Vol. 14, II Corinthians by Simon J. Kistemacher. Grand Rapids: Baker, 1997. A pedantic work that expounds the text but offers little help when it comes to applying the truth of the Word to the life of the believer. Kent, Homer Austin, Jr. A Heart Opened Wide: Studies in II Corinthians. New Testament Studies. Grand Rapids: Baker Book House, 1982. In his inimitable style, Kent expounds the theme of 2 Corinthians. His material is well researched and presented in a capable manner so that readers may draw maximum benefit from their study of this apostolic letter. Laurin, Roy L. Second Corinthians: Where Life Endures. Grand Rapids: Kregel Publications, 1985. With genuine devotional warmth, Laurin explains how life endures and matures in accordance with the plan and purpose of God. Recommended. Martin, Ralph Philip. Second Corinthians. Word Biblical Commentary. Waco, TX: Word Books, 1986. A learned commentary, fully abreast of the latest literary scholarship. The bibliographies at the beginning of each section are most helpful. The exegesis is such as to bring out new thoughts with a minimum of repetition from other commentators. Scant attention is paid, however, to the theme of the epistle. The primary values of this scholarly volume, therefore, lie in Martin's handling of the Greek text and his bibliographic references. Thrall, Margaret E. A Critical and Exegetical Commentary on the Second Epistle to the Corinthians. In process. Edinburgh: T. and T. Clark, 1994- . Replaces the earlier work by Plummer. Gives evidence of the writer’s exacting scholarship. Makes plain the meaning of the original text. From the distinctions drawn by Miss Thrall the perceptive pastor should be able to enliven and sharpen the focus of each expository message that he bases on this very personal epistle. 2 Corinthians 1:1-11 "Introduction To 2 Corinthians"
2 Corinthians 1:12-2:3 "Paul Defends His Integrity"
2 Corinthians 2:4-16 "Restore The Brother Disciplined"
2 Corinthians 2:17-3:6 "The Ministry Of Life Vs The Ministry Of Death"
2 Corinthians 3:7-18 "Beholding The Image Of The Lord"
2 Corinthians 4:1-7 "We Have This Treasure In Earthen Vessels"
2 Corinthians 4:8-18 "Momentary, Light Affliction Produces An Eternal Weight Of Glory Far Beyond Comparison"
2 Corinthians 5:18-6:2 "Be Reconciled To God"
2 Corinthians 6:3-10 "Endurance In Ministry Despite Difficulties, Hardships And A Lack Of Earthly Rewards"
2 Corinthians 6:11-7:1 "Open Wide Your Heart To Us"
2 Corinthians 7:2-16 "Godly Sorrow Produces Repentance"
2 Corinthians 8:1-9 "Giving From The Grace Of God"
2 Corinthians 8:10-24 "It Would Be Best For You If You Gave"
2 Corinthians 9 "Sow Sparingly And You Will Reap Sparingly, Bountifully And You Will Reap Bountifully"
2 Corinthians 10:1-6 "The Weapons Of Our Warfare Are Not Of The Flesh But Divinely Powerful"
2 Corinthians 10:7-18 "Do Not Compare Yourself With Those Who Measure Themselves By Themselves"
2 Corinthians 11:1-15 "Paul Begins His Fool's Speech"
2 Corinthians 11:16-33 "Fool's Speech Part 2: Paul Boasts About His Weakness"
2 Corinthians 12:1-10 "Fool's Speech Part 3: Power Is Perfected Through Weakness"
2 Corinthians 12:11-21 "Fool's Speech Part 4: The Fear Of Not Meeting Each Other's Expectations"
2 Corinthians 13 "Wrap Up / Examine Yourselves Whether Or Not You Are In The Faith"
2 Corinthians 11:16-33 THE SUFFERINGS OF PAUL. Defender's Study Bible - Excellent, conservative, literal study Bible notes from a leading creationist commentator. Paul's second canonical epistle to the church he founded at Corinth (there probably were at least two other letters he wrote to Corinth, but these have not been preserved—see 1 Corinthians 5:9 for a specific reference to one of them) was probably written less than a year after the first. It is uncertain whether it was written while he was still at Ephesus (Acts 19:10) or later at Philippi (Acts 20:1-6). 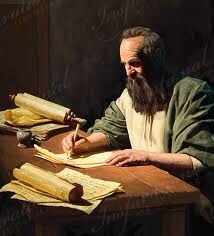 In any case, there is almost complete unanimity among scholars that 2 Corinthians was indeed written by Paul. Like 1 Corinthians, it is cited by numerous church leaders in the second century (Clement, Irenaeus, Polycarp, etc.). After Paul's departure from Corinth, the church had been injured spiritually, not only by the divisions and immorality discussed by him in 1 Corinthians but also by certain of the "Christ party" (1 Corinthians 1:12), who were now falsely claiming to be apostles of Christ (2 Corinthians 10:7; 11:13), and trying to undermine Paul's teachings. They were corrupting God's Word (2 Corinthians 2:17), and Paul was forced both to defend himself and to rebuke these false teachers with great severity (2 Corinthians 10:7-12:13). The epistle also notes with approval that the immorality condemned in the first epistle had been effectively disciplined (2 Corinthians 2:1-11). Paul's definition and defense of the ministry and true ministers of God in 2 Corinthians 3-6 is especially noteworthy, as is his discussion of the Christian grace of giving in 2 Corinthians 8-9. In summary, the two Corinthian epistles are filled with rich spiritual and doctrinal truths and also with stern rebuke against sin and heresy, and also as abundant instruction for practical Christian living. DEVOTIONALS - All of the devotionals below are compiled by chapter and verse. Studies in 2 Corinthians - 93 pages - Interesting resource. Outline format with lots of alliteration. 2 Corinthians 1:8-10 Can God Give More Than You Can Bear? 2 Corinthians 4:7-16 Where's the Power? 2 Corinthians 7:8-11 Any Regrets? 2 Corinthians 7:8-11 Repentance Or Just Guilt? 2 Corinthians 9:15 Giving Or Getting? 2 Corinthians 11:1-15 Which Jesus? 2 Corinthians 12:1-4 What's A Heaven For? 2 Corinthians 9:15: Thank God For Jesus! PHIL NEWTON - Mp3 only for the sermons without a link. Click for audios of all sermons. 2 Corinthians 10:1-6 The Christians' Weapons 1. 2 Corinthians 13:1-10 Do You Pass or Fail? 2 Corinthians 1:3 Run to this Heavenly Father! 2 Corinthians 2:12-17 How Can We Maintain Peace of Mind? 2 Corinthians 3:1-11 How Can We Gain a Sense of Competence? 2 Corinthians 3:12-4:6 How Can We Attain a Transparent Lifestyle? 2 Corinthians 4:7-15 How Can We Find Strength to Cope? 2 Corinthians 4:16-18 Our Light Affliction? 2 Corinthians 4:16-18 Suffering: Friend Or Enemy To Christian Joy? 2 Corinthians 4:18 The grand object of the eye of faith! 2 Corinthians 6:9 The Lord sometimes flogs His children home! 2 Corinthians 7:1 Will I Bring Myself Up to This Level? 2 Corinthians 7:4-7 Where Is God When It Hurts? 2 Corinthians 9:6-15 What Will You Give? How Will You Give It? 2 Corinthians 9:8 Abounding Grace! 2 Corinthians 11:27 Is It Time for You To Make An Attitude Adjustment? 2 Corinthians 11:28 Is There Good Anxiety? 2 Corinthians 12:7-10 Thankful for the Love of God! Why? 2 Corinthians 12:1-10 Triumphalism, Suffering, and Spiritual Maturity: An Exposition of 2 Corinthians 12:1-10 In Its Literary, Theological and Historical Context. 2 Corinthians 13:14 The Holy Spirit — A Partner Who Wants To Take Responsibility For You in This Life! 2 Corinthians 13:5 One of you is a devil! D Edmond Hiebert (these are actually comments on Morgan's related work "The Corinthian Letters of Paul. An Exposition of I and II Corinthians") - Carefully outlined pulpit expositions by a noted expository preacher. Reflects the fervent devotional approach of the preacher in dealing with the problems that plague the Church. First and Second Epistles to the Corinthians. Excellent sermon illustrations - the first list represents devotionals onsite followed by the list of off site devotionals by chapter and verse. 2 Corinthians 12 :9-10 The Blessings of Brokenness Jack M. Redfearn, Jr.
2 Corinthians 1:1-2:11 Why the Delay? Hint: Click on expositions and scroll down for numerous additional homilies on individual passages. 2 Corinthians 11:23-28 Is adversity ever caused by God? 2 Corinthians 5:17 Is Conversation (Conversion) Necessary? 2 Corinthians 1:1-11 Why Does It Hurt So Much? 2 Corinthians 3:1-11 Have You Got What It Takes? 2 Corinthians 3:12-16 "Who Is Sufficient?" 2 Corinthians 3:17, 18 Who Is That Masked Man? 2 Corinthians 13:5-14 Who Am I, Really? LINKS BELOW BOOK "AUTHENTIC CHRISTIANITY: A FRESH GRIP ON LIFE"
1st Why Does It Hurt So Much? (2 Corinthians 1:1-7) — In times of grief and troubles, do we find significance and comfort in knowing we are being equipped to serve others for Jesus' sake? 2nd The Sentence Of Death (2 Corinthians 1:8-11) — Are we counting on our living Lord to accomplish what He wants to do through us, or are we frustrating and exhausting ourselves with our self-reliance and self-effort? 3rd When You Are Misunderstood (2 Corinthians 1:12-2:4) — God always says yes to to what He has promised. How well do we understand His promises? How faithful are we to keep the promises and commitments we make? 4th Forgiveness: When Discipline Ends (2 Corinthians 2:5-11) — Do we abort God's gift of forgiveness by failing to extend forgiveness to others as He forgave us? When we do forgive, do we also seek to forget the offense? 5th Who Is Sufficient? (2 Corinthians 2:12-17) — When our thoughts and feelings are burdened and anguished to feebleness, can we let the light and power of the Spirit of Christ demonstrate His sufficiency through us? 6th Do You Have What It Takes? (2 Corinthians 3:1-6) — What is one of the most important truths in the Word of God missing in the church across the world? Can we clearly explain the different life in the new covenant? 7th A Fading Glory (2 Corinthians 3:7-11) — Is God's grace an embarrassment, or do we see the transcendent glory of relying completely on Him to give us value, and give us peaceful rest from self-effort? 8th Freedom To Remove The Mask (2 Corinthians 3:12-18) — Are we truly free to admit and look at our nature and capacity for evil? Do we wrongly rely on self-effort to overcome it? How does a growing freedom in Christ change us? 9th Nothing But The Truth (2 Corinthians 4:1-4) — Where and how can we strip off all the veils of illusions and delusions to see the truth about ourselves, about our lives, and about the world in which we live? 10th From Darkness To Light (2 Corinthians 4:5-6) — When we read the written Word of God, are we expecting to see the Person who is the Living Word? Where do we find the light of the glory of God? 11th The Life Of Jesus In Mortal Bodies (2 Corinthians 4:7-15) — Are we being so changed by our relationship with Christ that others who are in our lives see the glory of His character? How can we share in the dying of Jesus? 15th Sensible Fanaticism (2 Corinthians 6:3-10) — Following Jesus is a radical, other-worldly calling. If we were accused of being truly Christian, would there be enough evidence to convict us? 16th The Reciprocity Of Love (2 Corinthians 6:11-13) — Transparent communication stretches us and makes us vulnerable. Are we learning to be open-hearted to all, and thereby loving, for Christ's sake and by His power? 17th The Unequal Yoke (2 Corinthians 6:14-18) — Are we free from all men, yet servants of all? Do any of our relationships inhibit our freedom to love and obey God with all our heart, soul, and mind? 18th How To Repent (2 Corinthians 7:2-16) — Godly repentance cleanses and liberates us. Do we keep the door of repentance open to God's saving grace in us and through us? 19th Grace And Giving (2 Corinthians 8:1-15) — Jesus is our priceless Treasure. Are we learning to worship Him with all that we are and own? What may we be withholding from Him this day? 20th Giving Joyfully (2 Corinthians 8:16-9:15) — Grace-giving is a miracle that mirrors God's character. Are we therefore intent on knowing the Giver of such a radical gift? 21st Our Secret Weapons (2 Corinthians 10:1-6) — For every Christian, spiritual warfare is a given, whether engaged actively or passively. Are we alert to identify and engage our spiritual weaponry? 22nd The True Evaluation (2 Corinthians 10:7-18) — Do we resort to measuring and comparing ourselves with others? Are we finding contentment in simply serving as Christ's own beloved one? 23rd Godly Jealousy (2 Corinthians 11:1-2) — God is passionately jealous for the Good of His own people. Are we being freed from damaging our relationships with self-focused jealousy? 24th The Simplicity Of Christ (2 Corinthians 11:3-15) — Are we getting side-tracked by the superficial and secondary? Do we need to return to the main menu: the exquisite simplicity of the Gospel? 25th How To Boast (2 Corinthians 11:16-33) — Do we see the value of our failures as part of God's curriculum for training us in humble trust? Do we trust Him to redeem our failures? 26th Strength In Weakness (2 Corinthians 12:1-10) — Are we aware of the peril of spiritual pride? Can we receive our weakness and incompetence as a path to God's power at work in us? 27th The Remarkable Paradox (2 Corinthians 12:11-13) — Do we have growing confidence in the power and Presence of Christ in us, so that self-esteem is becoming a non-issue? 28th The Mark Of A True Servant (2 Corinthians 12:14-13:4) — God's love in Christ for us is immeasurable. Are we choosing to be living statements of that quality of love? Or do we put price tag on our relationships? 29th How To Examine Yourself (2 Corinthians 13:5-10) — How can we know whether we have true faith? What is the Evidence that we can really know and that others can see? What about when doubt strikes? 30th A Word Of Peace (2 Corinthians 13:11-14) — When faced with stressful divisiveness, quarreling, and/or jealousy in our personal & corporate lives, how and why can we remain friendly, loving, open, and forgiving? 2 Corinthians 7:11 Do We Find ‘Revival’ in the New Testament? 2 Corinthians 12:11-21 What Makes Churches Inferior?